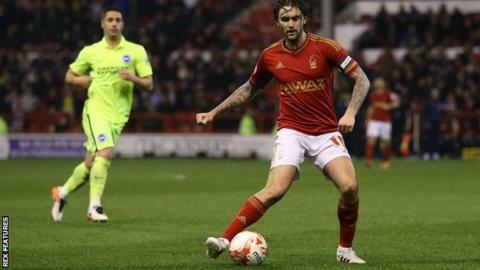 Nottingham Forest's Henri Lansbury says he was not played in his best position by former manager Dougie Freedman. The midfielder impressed when being used in a more advanced role by new boss Paul Williams in Monday's 2-1 loss against promotion-chasing Brighton. "I scored a few goals last season from playing attacking midfield," Lansbury told BBC Radio Nottingham. "I did say a few times... but I don't think that it quite registered with the last manager." Despite an improved team display in the second half, an injury-time goal by Steve Sidwell saw Forest beaten and they remain in danger of relegation from the Championship. The Reds are nine points clear of third-from-bottom Milton Keynes Dons, with five games left. Lansbury has played the last three matches after returning from an ankle injury that kept him out for three months, and the former Arsenal midfielder is happier with his new more attacking position. "I think you can see that's where I like playing and where I enjoy playing the most," he said. "It lets me express myself and gives me that free role to roam. If I want to go deep and get the ball, I can. "It's a bit different from sitting in there, tackling and trying to make the play happen from back there."